Nakano has always been a popular station for a number of famous ramen restaurants, but with the decline in popularity of traditional ramen shops and the rise of boutique ramen restaurants, a number of shops have opted to open closer to central Tokyo rather than the drinking alleys of Nakano. Recently however, ramen restaurants have begun opening up in the suburbs of Nakano targeting less populous areas with Mendokoro Kinari going as far as to moving their shop here. By moving to a less central location, shops can focus on producing for the select enthusiasts making a trek to their shop rather than the masses that queue in places like Shinjuku. Located just one station over from Nakano on the Sobu line, Mendokoro Kinari have begun a trend of boutique ramen shops making their business in small wards of Tokyo. Kinari is one of about 5 shops recommended by the Michelin Guide located in the small residential areas of Nakano and it may be the start of another ramen boom in the city. Kinari is a short five minute walk from Higashi Nakano station and its exteriors look more like a bakery than a ramen shop. The line forms behind the open sign in the window and someone will come out to guide you to the ticket machine when they are ready for you. An English menu is provided inside so feel free to ask as their menu changes seasonally. The pictured menu is one from the summer (late review, my apologies) with the bottom two menu items being the summer specials. 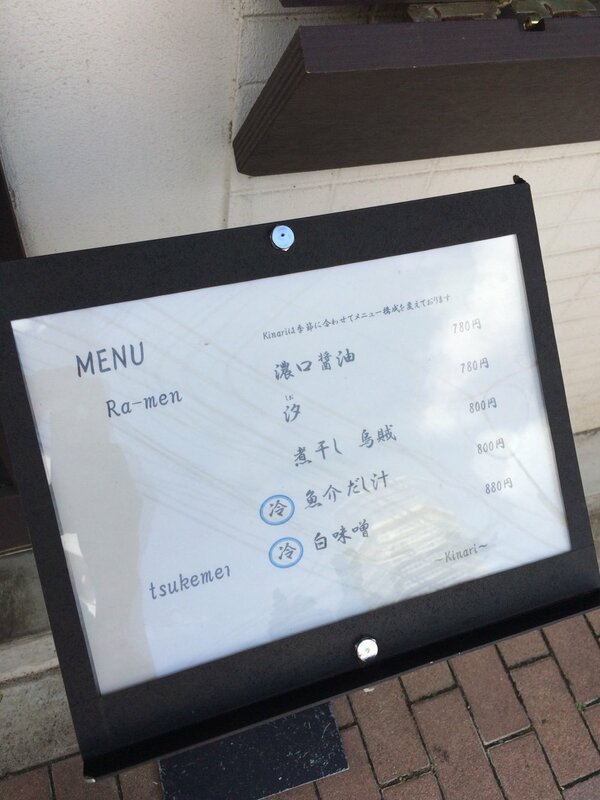 From top to bottom they have a Dark Shoyu Ramen for 780 yen, a Shio Ramen for 780 yen, a Niboshi Ramen for 800 yen, a Seafood Broth Cold Ramen for 800 yen and a Cold White Miso Ramen for 880 yen. As I was stopping by for a quick visit on this occasion I opted for the Tokusei Shio Ramen which comes with extra toppings fro about 200 yen more. As you can see the extra toppings comes on the side rather than in your ramen as some customers like to eat the toppings separately with a cold glass of beer. Therefore the pictured bowl is actually the same as the ramen you would get if you just got a regular Shoyu Ramen. A slice of duck char siu, chicken char siu, a few strands of menma bamboo shoots, Mitsuba (Japanese herb), roasted seaweed, and blanched mustard leaves top the bowl. For the tokusei toppings you get a marinated soft boiled egg and a couple extra slices of their duck char siu. The shoyu Kinari uses for their ramen is a dark blend which results in an incredibly rich and powerful shoyu flavor to the bowl. The broth is animal based with a variety of chicken and duck bones used for the soup. However, in contrast to the dark shoyu, the broth itself is quite light, with flavors pulled through a low simmer in order to prevent too much collagen and fat from muddling the broth. Combination of the light broth and heavy, dark shoyu tare work incredibly well to create a rich and savory soup without a making it too heavy. Contrary to its Dark Shoyu name, the bowl is actually quite refreshing and isn’t overpowering on the palette. The saltiness is definitely evident from the shoyu, but only enough to enhance the flavors of the broth, noodles, and toppings. Noodles here are made specifically for the shop and is a traditional straight noodle. I thoroughly enjoyed the noodles here as it was thin enough so that the flour aroma didn’t interfere with the soup and was perfect for clinging the right portion of soup. In terms of texture, it was a bit softer than I would like, but many enthusiasts actually prefer a softer noodle for dark shoyu ramen types so really just a preference rather than a knock on the bowl. The bamboo shoots and blanched mustard leaves were nice touches as they kept the seasoning low for the two and allows the customers to have a refreshing flavor change and added crunchy texture to the bowl. The menma bamboo shoots were quite stringy which is a recent trend among shoyu ramen restaurants and actually tasted quite nice with the noodles. Rather than a thick rectangular block where I had to take bites out of, the stringiness of the menma flowed with the ramen making it easier to eat and didn’t disrupt my eating rhythm. As you can see from the picture, the soft boiled egg was cooked to perfection. It was made at the perfect medium of runny and solid which I enjoyed thoroughly. The chicken char siu was also quite good. The poached chicken slices were moist and juicy and soaked up the flavor of the deep soy very well. As it was only lightly seasoned, the saltiness of the soup complimented the chicken slices well. My only complaint was the duck char siu slice. It was cooked perfectly and had a nice texture, but it didn’t seem to fit with the overall flavor profile of the ramen. The gamey flavor was still evident in the duck and it hindered my taste of the soup a bit. I could do without the duck, but I have heard mixed opinions about it. Some seem to love the variety and enjoyed the smoky aroma the duck added to the bowl. Mendokoro Kinari is already recognized by the Michelin Guide and has garnered a lot of the awards that one could win here in Tokyo. With that their new, smaller location here in Higashi Nakano has a nice neighborhood vibe with a cafe, chic interior that is very inviting for passerbys. I respected the husband and wife couple’s decision to move here and operate in a smaller space for their sake enjoyed my visit. I definitely need to come back to try their other seasonal menu items and will update my review as soon as I do. All and all, if you’re looking for a friendly, laid back ramen shop, this is definitely the place for you. Come have a try on your next ramen adventure.